Mark Malonzo:Volkswagen Polo :: James May:Fiat Panda. The Polo is unmistakably a base model. For the sake of pricing comparison, I have selected the Spanish VW lineup. Starting at €13.470, the Polo sits €5.000 below the next-in-line Golf. The quality difference between the Golf and Polo’s interiors is instantly recognizable. Though hard plastic surfaces coat most of the Polo’s cabin, even the roughest of unpaved roads failed to produce any discernable panel squeak. Wearing the VW badge, the Polo easily and quite elegantly pulls off a tastefully restrained aesthetic (though admittedly an American marque applying the interior would be accused of lacking originality). I now turn the focus to the crank to the right of the rear-passenger door pull. A once ubiquitous piece of automotive interior design, the manual window crank now speaks to the Polo’s character. The driver seeking to satisfy himself with the convenience of electric windows in the front and minimalist reliability in the rear will find comfort here. Those in need of electric gizmos to impress friends have the option of adding on the additional electric rear windows (a €600 self confidence-tax). Accounting for Volkswagen reliability, the fewer add-ons, the better. With respect to additional on-board amenities, the Polo provides a satisfactory single-zone manual HVAC equipped with front and rear window defrosters. The gauge-cluster display provides the current time, temperature, odometer, trip odometer and fuel level. The monochrome screen additionally displayed current gear and an upshift/downshift indicator when the vehicle deemed appropriate. Though certainly a helpful driver aid for students and the elderly, the shift indicator seemed consistently hellbent on reaching fifth. Thankfully VW has made the system as unintrusive as possible by devoting only the small upper-right hand corner of the display to the feature. Since my tester was equipped with an aftermarket stereo, I cannot comment on audio quality. In terms of interior convenience, the Polo offers the typical VW non-navigation model storage cubby in the second DIN of the center stack in addition to deep storage pockets on all four doors, two cupholders up front, and a storage cutout just below the handbrake appropriately sized for a modern smartphone. 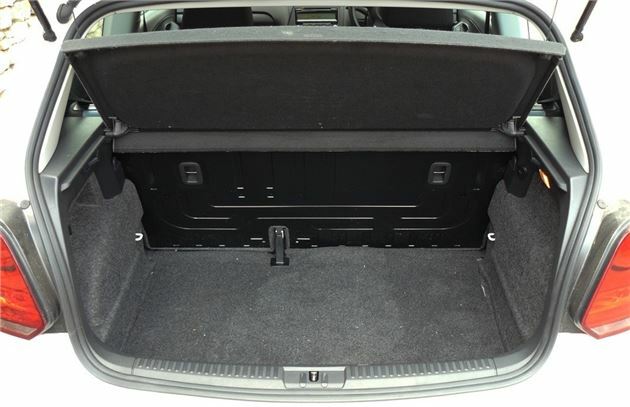 The rear seats fold in a 60/40 configuration. In line with the hyper-practical approach, the Polo’s packaging is downright brilliant. Front seat passengers could feasibly forget that they are sitting in a compact. Rear seat passengers have more than adequate legroom and a good amount of under-seat space to accomodate feet. Though doors on the three door models open a bit wider, the five door model still manages to best its competitors, if only by a few millimeters. Described in the vague rental-car terms, the cargo area is suitable for two large suitcases and one small bag. That equates to 280 litres seats up and an impressive 953 litres seats down (a bit smaller than the Fiesta’s 290/979). Compared to the Fiesta’s more pronounced humps on either side of the opening, the Polo has a refreshingly unintrusive entry point. You would be correct in perceiving the Polo as a spartanly equipped, sensible 5-door. In fact, it’s more sensible than first meets the eye. The relatively soft damping reduces minor road imperfections to nearly imperceptible vibrations. Where pavement disappears, the cabin maintains satisfactory isolation considering the vehicle’s class. VW’s 5-speed is in a word: sublime. The Polo provides a satisfying in-gear feel without jitters or thunks. The shift pattern is predictable, throws are light and the clutch and shifter provide enough travel to create the sensation that the driver is actually shifting gears. There’s a time and place for short-throws…a 60PS Polo is not one of them. Adding to the simplistic bliss is a reverse gear engaged with an intuitive downward push and shift to the upper left. The 5-speed manual alone brings more than enough joy to compensate for the lack of raw horsepower, spec-sheet bragging rights, and electronics. Ignoring the stopwatch-wielding M3 drivers is a daunting task, but availing yourself to the opportunity to engage with simple mechanical harmony, purposeful design and an engine that can be used to its fullest extent is a remarkably rewarding experience. Your wallet may thank you too. And this makes the 2012 VW Polo one of the most selfish purchases you can make. Perhaps one of the best as well.